[Quinn Dunki] got tired of messing around with wires when connecting things to her benchtop power supply, so she built herself useful little power bridge that plugs directly into any standard breadboard. The board is small and simple, but quite useful all the same. It was built to power both sides of the breadboard, and it can be easily switched between an unregulated power supply and a regulated 5v supply. An ammeter can be attached to the board via a pair of pins she set aside, allowing her to easily measure the current draw of the entire circuit. We think her “Juice Bridge” would be very useful to anyone who frequently prototypes on breadboards. In fact, it would be a fantastic beginner project since it involves etching and developing PCBs as well as some simple soldering, while resulting in a handy takeaway tool at the same time. If you want to build one of your own, [Quinn] has the schematics and Eagle PCB files available for download on her site. The problem of persistent and reliable storage plagues us all. There are a myriad of solutions, some more expensive than others, but a dedicated and redundant network attached storage solution is hands down the best choice for all problems except natural disaster (ie: fire, flood, locusts) and physical theft. That being said, the issue of price-tag rears its ugly head if you try to traverse this route. [Phil’s] had his mind stuck on a very large NAS solution for the last ten years and finally found an economical option. He picked up a powerful motherboard being sold as surplus and a server enclosure that would play nicely with it. It came with a backplane for multiple hard drives that utilized SCSI connections. The cost and availability of these drives can’t compare to the SATA drives that are on the market. Realizing this, [Phil] completely reworked the backplane to make SATA connections possible. It’s an intense amount of work, but there’s also an intense amount of documentation of the process (thank you!). If doing this again his number one tip would be to buy a rework station to make it easier to depopulate the connectors and extraneous parts from the PCB. Since he needs to keep using the board, the old blow-torch trick is out of the question. This miniature “spy satellite” may not gain the ire of the Chinese People’s Army, but it will certainly look rad on your desk. Besides looking cool, this “satellite” is able to transmit video up to 300 feet away and has sun tracking solar panels for battery recharging. Additionally, it has a LED “thruster” and speakers. One cool thing about this build is that the body was made out of a lamp from Goodwill. Recycled/thrift store enclosures always make a good addition to your project as they won’t break the bank. Additionally, they may yield some other bonus parts when taken apart. In this case, the lamp fit into the project scope perfectly, but anyone trying to duplicate it might not be so lucky. Creative use of other household materials rounds out this build, with solar panels taken off home garden lights, and part of a nose hair trimmer used as the “thruster” body. This well-build project is a great example of how to convert household items into something totally different and unique. Why risk frostbite and altitude sickness when you can marvel at the view from atop your own mountain climbing game? [Jeff] built this delightful piece which you can see in action after the break. he combined several very simple ideas and he did it really well. The climbers are both mechanical. They grip the mountain’s face (which is covered with of carpet) with a tack pointed downward on the end of each limb. Their motion is provided by two tiny servos that make up the body of the climber. The two potentiometers in each controller directly affect the movement of the top and bottom limbs. The game plays music during the contest, and precisely detects a winner by sensing when an arm comes in contact with the metal snow cap at the summit. Obviously weight was an issue during the design process. After some hemming and hawing [Jeff] decided to tether the climbers in order to avoid rolling a battery into each. 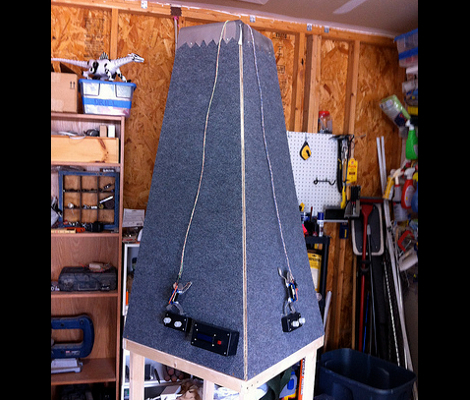 But he overcame the issue with weighted cable management on the inside of the mountain. First up is [Bertho’s] Pointless Switch machine. This machine is yet another take on the ‘most pointless machine’. It looks like his server couldn’t handle the load from his video so he moved it over to youtube. You can find it here. This week’s most popular post was the tutorial created by our writer [Brian Benchoff]. In this tutorial, he shows how you can insert your logo into a still-readable QR code. After that is this post showing how you can resurrect your IBM model M keyboard to use it as a bluetooth device. Finally, we wrap up our roundup with a brainwave disruptor. This device allows [Rich] to experiment with light and sound to see how it affects brain waves. danang.saputro liked Park Asset and Condition Monitor. 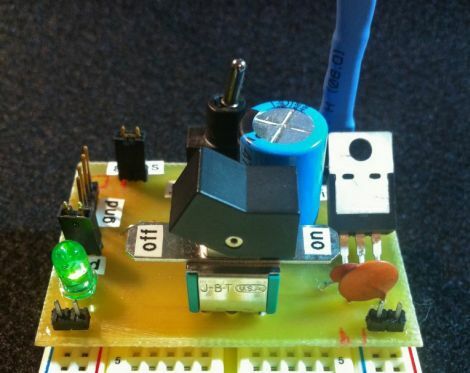 Tinkers Projects has added a new project titled Battery Monitor. Daisy liked Small Word Clock. Tinkers Projects has added a new project titled Balance Game. Cecep liked Park Asset and Condition Monitor. Tinkers Projects has added a new project titled LED Plate. Matt Bradshaw has updated the log for DrumKid: aleatoric drum machine.